Robert Whittaker (r) is challenged to a unification clash by champion Michael Bisping. Humble, hard-hitting and with a high fight IQ, Robert Whittaker might just be the complete package. The 26-year-old Australian claimed the interim middleweight title with victory over Yoel Romero in the surprise main event of UFC 213 and he did so compromised for four-plus rounds. Indeed, Whittaker battled back from losing the first two sessions – the first of which saw his left knee hyper-extended by a blunt front kick from the Cuban – to surge to a unanimous decision having taken take the final three frames. It was a deeply impressive performance and one which now sets up a unification clash with champ Michael Bisping. While many feared the fate of the Brit against Romero, on the evidence of Saturday, Whittaker could in fact provide the tougher test. In the last 15 minutes of the bumped-up main event after Amanda Nunes pulled out of her bantamweight title defence with Valentina Shevchenko hours before doors opened through illness, he dabbled with perfection. Throughout his eight-fight unbeaten run in the UFC, Romero has been a phenom. The 40-year-old is a genetic freak wrapped in one of the most athletic frames MMA has ever seen, but in Las Vegas his muscular exterior failed to hide his stamina deficiencies. His Olympic silver-medal wrestling pedigree is the stuff of legend but on one leg, Whittaker shut down the rampaging Romero with exemplary takedown defence while producing punches in bunches to control the volume of strikes. 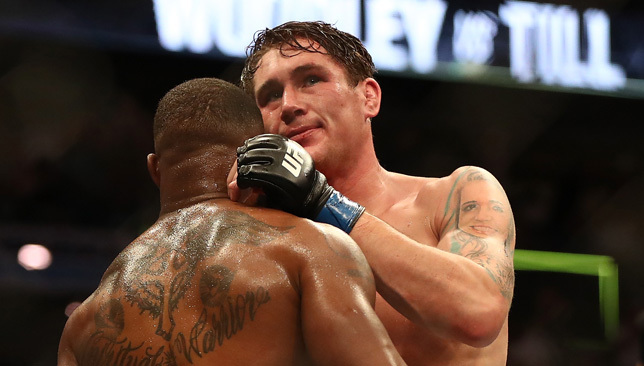 “It (the injury) bothered me pretty good,” said Whittaker after his eighth straight win. “I sustained an injury in camp. I thought it would be 100 per cent, but he kicked it and set it back weeks. “It was unstable. Had he got another good one, I would have dropped. I know that Romero will capitalise on any weakness he sees, so I had to play it off. The best are born out of adversity and the mental fortitude Whittaker displayed on Saturday showed not just heart, but crucial maturity. The experience of back-to-back wins against Jacare Souza and now Romero will provide an invaluable, if not slightly unusual progression to Bisping. 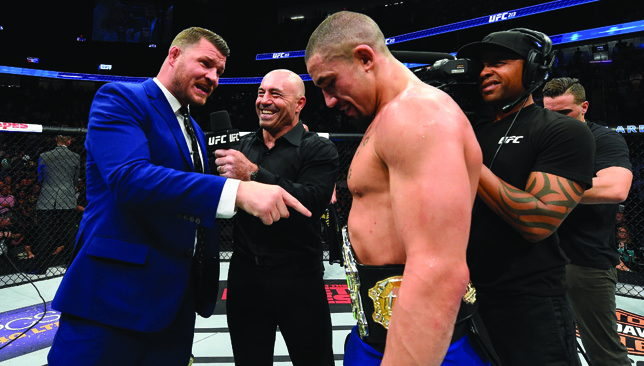 The smack talk was vintage Bisping but although many will point to the mild-mannered Whittaker as the complete antithesis to the champ, there are parallels to be drawn which makes their potential clash feel like a passing of the torch. Indeed, the New Zealand-born Aussie will now ascend into assuming almost ambassadorial status for a market the UFC are determined to dominate. 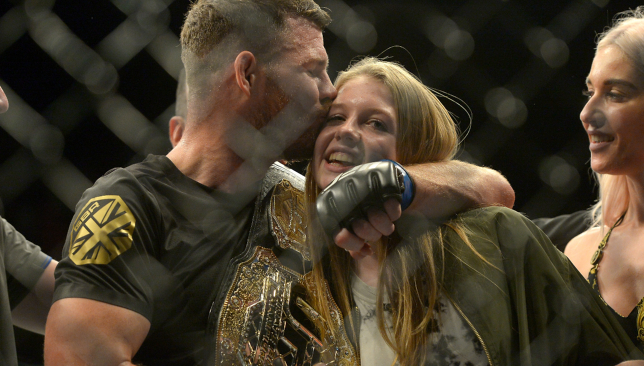 Bisping likewise has long been the standard-bearer as the promotion cracked Europe and it’s no secret that after nearly two decades of competing at the top, he is entering the final phase of a stellar career. At 26, Whittaker is undoubtedly the future of the company and there is every chance he will take over as the face of a burgeoning market just like Bisping did. Another fighter to have led the way in a market outside of North America was also victorious at UFC 213 – albeit in decidedly less impressive fashion. Alistair Overeem narrowly edged Fabricio Werdum to take their trilogy after the Brazilian won their first meeting in Pride in 2006 before the former won their strikeforce heavyweight rematch in 2011. The Dutch legend, who started his camp for this clash in Dubai, squeaked past the former UFC heavyweight champ with a majority decision to realign himself for a shot at a title sequel with Stipe Miocic. “The hard work continues. I fought Stipe for the heavyweight belt. I didn’t get it. I doubled down and went back to work, and I’m not going to stop until I get the heavyweight title,” Overeem said, having earned $800,000 for his night’s work, the highest undisclosed payday on the card. 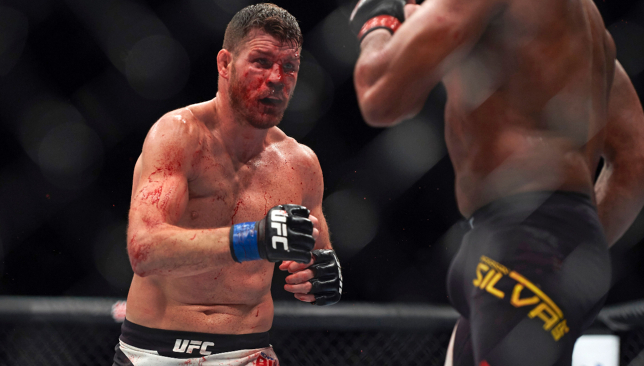 It’s ‘Showtime’ once more as the former WEC and UFC lightweight champion looked like the fighter of old as he tore apart a dogged Jim Miller on his return to 155lbs. The 30-year-old had lost four of his previous five fights, including an interim featherweight title clash with Max Holloway. But back at his natural weight class Pettis looked smooth, creative and his timing on point. He took a unanimous decision and it’s one which many will hope gets him back on track. UFC president Dana White was incensed the bantamweight champion pulled out of her UFC 213 main event bout with Valentina Shevchenko. The Brazilian cited illness and apologised to fansafter she was force to withdraw from the clash on fight day. However, White was adamant Nunes was fit to fight after being cleared by doctors stating that the reason for cancelling was “90 percent mental and 10 percent physical”. It looks like the bantamweight title match up will now be rescheduled to take place at UFC 215 in September. Five years ago last week, Anderson Silva reached his zenith as he successfully defended his UFC middleweight title for the 10th straight time with a second-round stoppage of Chael Sonnen. In what was one of the most anticipated rematches of all time – Sonnen had come closest to beating the Spider and hyped the rematch – Silva pulled off one of his biggest wins as he rocked Sonnen before finishing the job with Sonnen on his knees. 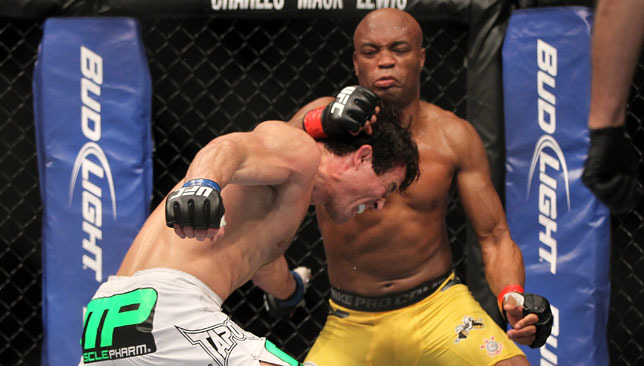 Anderson Silva (right) punches Chael Sonnen at UFC 148.